Focus on Asia and Europe; throughout the sands of time they have been the major powers in the sport of table tennis but as the second day of the qualification tournament, Thursday 24th November, for the 2017 ITTF Challenge Spanish Open in Almeria begins, it is to Africa and to North America that we look. The focus is on Canada’s Marco Medjugorac and Nigeria’s Olajide Omotayo; the question to be answered is as to whether they can maintain the form of the opening day. Listed at no.502 on the current Men’s World Rankings, on the opening day of action Olajide Omotayo beat Turkey’s Ibrahim Gündüz, named at no.230 (12-10, 11-5, 3-11, 11-8, 12-10). An upset, now on the second day of action can he cause a second upset? In the contest to decide first place in the group and progress to the main event, he must cause another surprise, he confronts Kazakhstan’s Denis Zholudov, ranked no.442. Similar to Olajide Omotayo on the first day of play he beat Ibrahim Gündüz (11-8, 11-9, 8-11, 10-12, 12-10, 11-8). In a similar fashion Marko Medjugorac must cause somewhat of an upset if he is to top his group. Standing at no.498 on the present day Men’s World Rankings, he opposes Sweden’s Anders Eriksson, listed at no.415 but his situation is somewhat different to that of Olajide Omotayo, he starts the second day as the only unbeaten player in the group. On the first day of action, he beat the leading name in the group, Scotland’s Gavin Rumgay, ranked no.250 (11-6, 13-11, 11-6, 7-11, 4-11, 6-11, 11-8); in the next contest Gavin Rumgay accounted for Anders Eriksson (8-11, 4-11, 8-11, 12-10, 13-11, 11-6, 11-8). It is exactly the same situation for Italy’s Jordy Piccolin, ranked no.510; a player who also started the tournament as the lowest rated in his group. Likewise he faces a Swede to determine top spot in the group. He confronts Oscar Perman, named at 431 on the world list. Furthermore like Olajide Omotayo and Marko Medjugorac, he enters the second day in confident mood; similarly on day one he beat the leading name in his group. He accounted for Belgium’s Lauric Jean, ranked no.249 (11-6, 8-11, 10-12, 11-7, 13-11, 8-11, 11-8); notably Lauric Jean in his second contest beat Oscar Perman (12-10, 11-9, 6-11, 11-8, 11-7). Meanwhile, in the Women’s Singles qualification tournament, the situation is very different; the leading names all enter the second day with unblemished records but equally they face players who also enjoyed first day success. In the concluding group stage matches, the Czech Republic’s Dana Cechova meets Italy’s Veronica Mosconi, Laura Gasnier of France confronts India’s Selena Selvakumar, Switzerland’s Rachel Moret opposes Estoinia’s Avi Avameri. Similarly, Stéphanie Loueillette, also from France, plays Egypt’s Yousra Helmy. 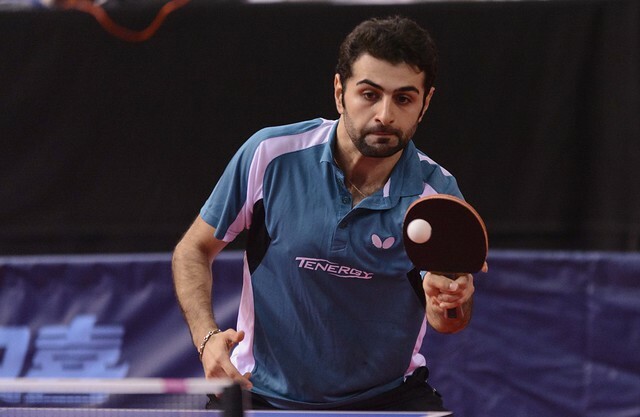 In the Men’s Singles event, players finishing in first place in each group advance to the main draw, the runners up progress to a preliminary round; in the Women’s Singles competition, players who top group no.1 to group no.12 gain main event places, those in group no.13 to group no.20 compete in a preliminary round.